Impact Ohio is excited to announce that Ohio’s 49th Treasurer of State, Robert Sprague, will be in attendance and speaking at the 2019 Akron Regional Conference on Tuesday, April 23 at 2 p.m. at Quaker Station at the University of Akron. 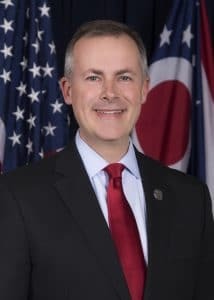 Robert Sprague currently serves as Ohio’s Treasurer of State where he oversees the state’s investment and debt portfolios, domestic & international custody portfolios, and annual cash movements and deposits. Sprague earned an undergraduate degree in mechanical engineering from Duke University and an MBA with an emphasis in finance from the University of North Carolina, where he graduated 7th in his class. In his private sector career, Sprague served as a management consultant for Ernst and Young, advising companies world‐wide on complex business matters, before owning and operating his own investment consulting firm. As Findlay City Treasurer and Auditor, Sprague balanced city budgets and helped finance a massive recovery effort after historic floods and the 2008 economic crash ravaged the city. He also helped Findlay improve its credit rating, lower its debt service costs and create the city’s first annual financial report to help people better understand city finances. In the Ohio House of Representatives, Sprague led the effort to combat our state’s deadly opioid epidemic by working with law enforcement, community leaders and doctors to prevent prescription drug diversion, curb overdose deaths, and improve our treatment systems. Sprague voted for $5 billion in tax cuts, eliminated an $8 billion budget deficit and ended numerous rules and regulations cramping job creation. We look forward to having Treasurer Sprague join our regional conference to discuss issues that are important to both him and Ohioans.